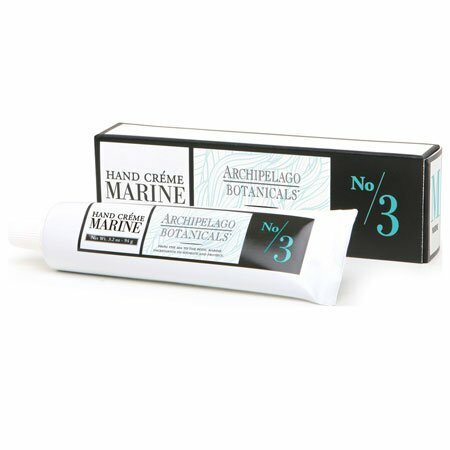 Archipelago Marine Hand Creme uses botanicals from the sea to moisturize the skin in a spa fresh fragrance. This non-greasy cream is luxuriously thick and long lasting to thoroughly hydrate dry skin and chapped hands. Blends natural blue sea kale, which is rich in nutrients, with gentle algae, and other marine ingredients to provide a daily dose of antioxidants for youthful and refreshed skin. The fragrance includes notes of Green Mandarin, Coastal Jasmine, Driftwood, Tonka Bean, and Azonic Musk. Paraben free. Made in USA. 3.2 oz., 94g.